This article demonstrates how to enable the clear selection button and change its content. 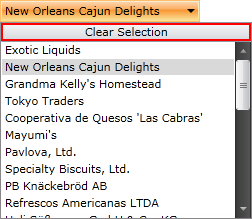 The RadComboBox offers an additional button displayed in the drop-down part, which is responsible for clearing the selection. By default this button is not visible. However you could make it visible by using the ClearSelectionButtonVisibility property. Also you have the ability to set the content of the button clearing the selection to anything you want.